Over the centuries, the region has made major investments along its coastline. Homes, businesses, rail lines, airports, factories, power plants, and other infrastructure has been built in places that are now threatened by the effects of climate change, primarily storm-related flooding and permanent sea-level rise. Adapting these densely populated communities and critical infrastructure is complicated and expensive, and special consideration will be required in socially vulnerable neighborhoods. But where the densities justify it, investments must be made in resilience projects that will ensure the region continues to thrive in the era of climate change. Today, more than one million people in the region live in flood-prone areas, with more than half a million living in dense urban areas, and 385,000 people working there. One-third of the residents in these at-risk communities are elderly, low-income, disabled, or otherwise socially vulnerable. Surges from Superstorm Sandy breached many of the barriers and sea walls in our coastal urban centers, damaging over 600,000 homes in 2012, claiming the lives of 60 people, and bringing parts of the region to a grinding halt. When the urban core shuts down, the economy slows and the transportation network and waste treatment plants no longer function, threatening the safety and livelihoods of communities. Efforts to improve resilience have been inconsistent and wholly insufficient. Although few programs have the funding to be fully implemented, some local resiliency projects are underway, thanks in part to the innovative Rebuild by Design initiative, New York City’s Special Initiative for Rebuilding and Resiliency, and other state and local efforts. While many communities are beginning to address the increased frequency of coastal flooding, most have not started planning for the long-term consequences sea-level rise will have on neighborhoods and infrastructure. Many parts of the region are highly vulnerable to flooding. Some are vulnerable because of their physical exposure—the density of population, jobs and infrastructure. Other areas are vulnerable in another way too: because of their social exposure—the places with large numbers of people without the resources or abilities to withstand or recover from a disaster. The future of the entire region depends on whether we can adequately protect the urban core from catastrophic emergency flooding and adapt to the permanent flooding caused by sea-level rise. Building a large surge barrier to protect the core is one solution to evaluate, but there are many unknowns about the effectiveness, impacts, and costs of a barrier. Even in a best-case scenario, it would take many years to plan and construct a barrier, and require local adaptation strategies to address sea-level rise, wind, and inland flooding. In any given community, a combination of resilience strategies will most likely be necessary, including traditional “gray” infrastructure (berms and levees, sea walls, and pumps), natural strategies like restored wetlandsand floodable land, as well as policy changes such as zoning codes and land acquisition. Such comprehensive adaptation planning can create synergistic benefits (e.g., berms that create public open space, or buyouts that open up land for new mitigation infrastructure), while adaptation strategies should be evaluated for their cumulative effects. In New York City, progress on the city’s $20 billion Special Initiative for Rebuilding and Resiliency is being made. A new resilient boardwalk and dune system along the Rockaways has been completed, and rock barriers in Sea Gate have been established. The state bought out 300 homeowners in Staten Island’s Oakwood Beach to demolish the houses and return the land to nature. But the list of planned projects far exceeds the list of completed ones, including the most ambitious out of the Rebuild by Design initiative slated for the Lower East Side (due to break ground in 2019) and Lower Manhattan as well as the new oyster reef being designed off the coast of Staten Island, due to begin as soon as 2018. Full funding of all of these very expensive projects has been a factor, as has the slow-but-necessary pace of community planning, and state and other permitting. Bridgeport, Connecticut, Hoboken, New Jersey, and a handful of communities in the New Jersey Meadowlands have also been slowly progressing through design, planning, and permitting of Rebuild by Design projects to stem storm surges and minimize flooding from stormwater. Other less-ambitious efforts, including home and street elevations, construction of seawalls and bulkheads, and installation of pumps are taking place in communities throughout the urban core. For many communities, waterfront parks—which in many places effectively serve as the first line of defense against coastal flooding—can be designed to provide even better protection. For many projects, the focus has been much more on addressing storm-related flooding than on the effects of sea-level rise. As coastal cities implement short- and mid-term resilience projects, they must also start planning now for the permanent flooding from sea-level rise and higher storm surges. And the range of options for addressing these risks—from hard or hybrid infrastructure to nature-based solutions—should be considered based on community needs and risk factors. All coastal cities and towns should have comprehensive, long-term adaptation and resilience plans with site-specific recommendations for their most at-risk areas. These should not only consider storm surges, but also the long-term impacts of sea levels rising. States should lead the way by requiring agencies that have land and assets in flood-prone areas to formally include climate change planning in their long-term plans. New York State’s Community Risk and Resilience Act, which adopted official sea-level-rise projections and requires the consideration of flood risk, is a step in this direction. Agencies and utilities responsible for the region’s critical infrastructure must also assess their risks and adapt to future conditions. Municipalities and communities should be provided with technical and financial support to understand the risks, evaluate trade-offs, and pursue the resilience strategies that meet their needs, with priority given to historically marginalized and underserved communities. This support could come from states and counties, or from a peer-to-peer network like the New York Region Climate Action Network, that would allow communities to exchange knowledge and resources and have a unified voice for adaptation funding and policy reforms. 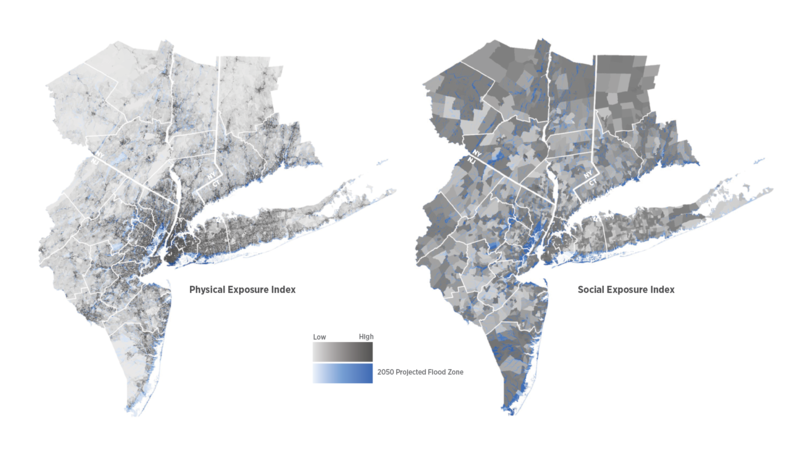 Communities with a large number of low-income residents and public housing in high-risk flood zones—such as neighborhoods along New York City’s Rockaway barrier beach—would require a different approach, as typical tools such as buyout programs and protective infrastructure would not ensure the safety of residents. Edgemere residents working in partnership with the New York City Department of Housing Preservation and Development have started investing in waterfront parks that, in addition to being community amenities, provide short-term protection against storm surges until a real transition away from the neighborhood can take place. Ultimately, the Regional Coastal Commission should coordinate and work closely with all levels of government to plan for and implement priority adaptation projects by investing revenues from the Adaptation Trust Funds. The Commission would oversee the creation of a comprehensive, long-term, regional adaptation plan that would identify areas at greatest risk and help implement projects that are complementary and effective. If short- and long-term adaptation is properly planned for and adequately funded, the region’s urban core could continue to thrive and grow, with significantly reduced risk from catastrophic and long-term sea-level rise flooding. Some areas would see decreases in population and increases in natural systems. Others would receive more protective infrastructure—ideally combined with community uses—along with more resilient development. By 2020, every coastal urban center should have an adaptation and resiliency plan with specific projects outlined. A network would be in place to share information among municipalities and across boundaries. Planning for sea-level rise would be integrated into adaptation and resilience strategies. Ground would be broken and work underway on many of the ambitious adaptation projects being planned today. By 2030, most, if not all, of the adaptation projects that today are planned or underway would be completed. Hundreds of thousands of residents would live with minimized risk of catastrophic flooding, and the majority of projects outlined in new adaptation and resiliency plans would have completed planning stages and be starting construction. Municipalities would have collaborated through a Regional Coastal Commission to complete an integrated and comprehensive urban adaptation plan. Low-lying communities would begin to implement projects and policies to respond to the permanent flooding from sea-level rise that would be starting to affect a number of communities. By 2040, coastal urban centers would be working together to complete projects in the comprehensive plan and make adjustments as sea-level rise increases. Completing adaptation projects would require tens of billions of dollars over the next few decades. Funding for most of the projects underway has come from the federal government in the form of disaster relief, or occasionally from preventative programs like the Hazard Mitigation Grant Program from the Federal Emergency Management Agency (FEMA). To supplement federal revenue and ensure a more stable and reliable source of funding, the Fourth Plan recommends the development of state Adaptation Trust Funds. We must also address further challenges to implementation, including outdated regulations and bureaucracy, as well as the political will, to succeed. Projects should be evaluated using benefit-cost analyses that take into account environmental and social impacts. Communities should be offered incentives for regional coordination and hazard mitigation, similar to the NFIP Community Rating System program, which reduces flood insurance premiums up to 50 percent if concrete efforts are made to strengthen resilience.